We are right in the middle of the action at Waihi Beach. 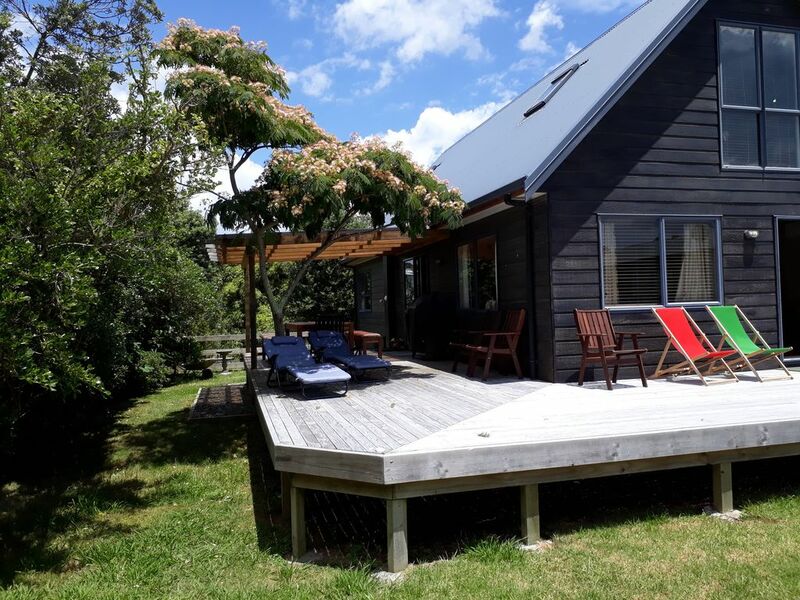 From here you can walk most places, enjoy all Waihi has to offer, then come back, have a hot outdoor shower and relax in shade and privacy. Take the kayaks up the stream or down to the beach. Waihi Beach has spectacular coastal walks such as Orokawa bay and Shelly Beach. Awesome surfing, safe swimming and great fishing. Launch from the beach or take a 5 minute drive to the boat ramp at safe and sheltered Bowentown Harbour, which is ideal for windsurfing, kite sailing and kayaking. Boutique shopping at the Beach Village, including yummy bakery and supermarket, and our beautiful, long, white, sandy beach is only a 2 minute walk away. It's a 5 minute drive to Historical Athenree Homestead and relaxing mineral hot pools. Our tennis courts have stunning views of the beach and shade from the Pohutukawa trees. The local library is a 10 minute walk away, with free access to Wifi, plus skateboard park, public tennis court. The Waihi Beach Pub is on the summer concert tour, having the largest marquee in the southern hemisphere and great bands coming through the Christmas break. Check it out on the their website. Waihi township, is a 12 minute drive away and has a 1st class 18 hole golf course, a range of shops, supermarkets, and is the home of New Zealand's largest opencast mine. Nearby Karangahake Gorge has spectacular walks through historical mining sites, and tunnels, waterfalls, swimming holes as well as having the recently completed Hauraki Rail Trail, where you can bike or walk beside the Ohinimuri River which passes through the gorge amid spectacular rugged scenery, tunnels and historic ruins from mining days... So come and join us for fun and relaxation on our quiet street, away from the hustle but you can walk to the action and beach when you want it.. Chill out at the Flat White Cafe and enjoy the beach. Creek gives kayak access to beach. Kayaks provided. Plenty of room for cars, boats, volleyball etc. Walk straight down the road about 250m to Waihi Beach. Also Two Mile Creek is behind the house. You can kayak down to the beach about 250m also. Had a lovely stay here while riding the Waihi rail trail. Great stay and very tidy house with everything we needed. My family and I loved our stay here, the house was perfect with lost of space for the little ones to run around. The house is close to the beach and a short walk to the shops. Geoff was really easy to deal with, I would definitely stay again. Great couple and friends really looked after the place and made the most of ther good weather. Thanks. Fantastic bach, was perfect set-up for our extended family. Loved the outdoor shower and the big wide deck area. Location was perfect, close to beach and shops. Spacious house with all day sun. Great deck area for BBQs and 5min walk to shops and cafes. The property and location were ideal for our three generational group. The property and location were ideal for our three generational group. Accommodation was clean, comfortable and well resourced. We were confident that our two pre-schoolers were safe from water and road hazards. It was an easy stroll to the supermarket, cafes and the beach. We would love to use this property again sometime in the future. Thank you and so glad you had a good time. You are very welcome to come again! Super location, handy to the beach and amenities. Super location, handy to the beach and amenities. The house really suited our family get together and the deck was great to have an evening BBQ and relax. Also loved the outdoor shower when you came back from the beach. We definitely plan on returning. Thank you we have also now put in a drive. We'd love you to come stay again. The beach is close and excellent for swimming, surfing, kayaking, paddleboarding, sunbathing, beach walks and biking along the beach, fishing and blokarting.